UNITED NATIONS: The United Nations has honoured at a solemn ceremony 128 military, police and civilian personnel from 38 countries, including seven Pakistanis, who lost their lives while serving in peacekeeping operations during 2017. Friday’s ceremony marked the annual International Day of Peacekeepers during which the Dag Hammarskjöld Medal was awarded posthumously to the peacekeepers who have given their lives for the cause of peace, during the preceding year. 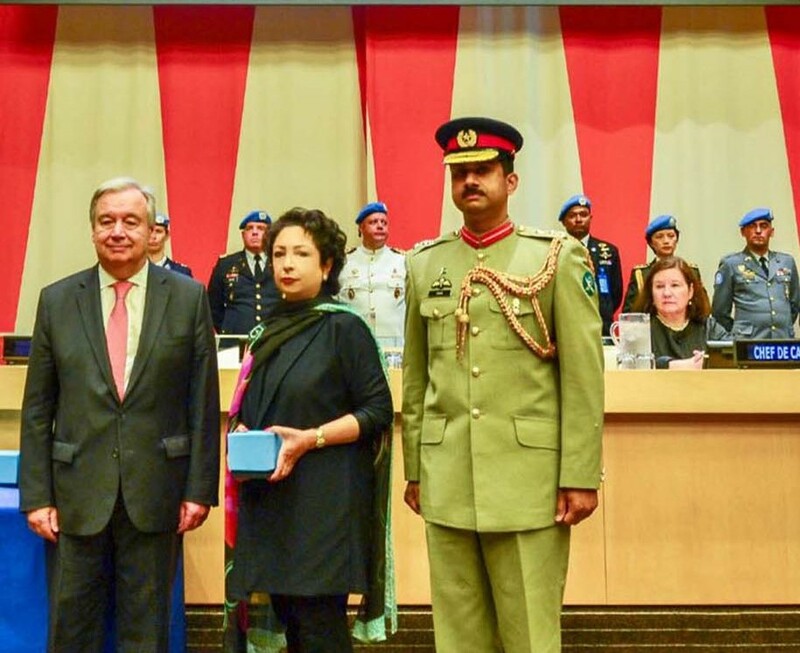 Pakistan’s Permanent Representative to the United Nations, Ambassador Maleeha Lodhi, accepted the awards on behalf of the families of the seven fallen Pakistani peacekeepers. They are: Sepoy Hazrat Bilal, Naik Abdul Ghafoor and Naik Muhammad Ali who were deployed with the UN Multidimensional Integrated Stabilization Mission in the Central African Republic (MINUSCA); Sepoy Muhammad Ishtiaq Abbasi, Sepoy Tariq Javed, and Naik Atta ur Rehman who served with the UN Organization Stabilization Mission in the Democratic Republic of the Congo (MONUSCO); and Sepoy Yassir Abbas from the African Union United Nations Mission in Darfur (UNAMID). Pakistan is one of the largest contributors of uniformed personnel to UN Peacekeeping. It currently contributes nearly 6,000 military and police personnel to the UN peacekeeping operations in the Central African Republic, the Democratic Republic of the Congo, Haiti, Mali, Somalia, Sudan, South Sudan and Western Sahara. In his remarks, the secretary-general, who led a moment of silence to remember the fallen peacekeepers, expressed his “deepest condolences and appreciation” to the family members and friends of those who died, as well as his “deepest sorrow and greatest appreciation” to the countries that contributed the troops and police officers. Jean-Pierre Lacroix, Under-Secretary-General for Peacekeeping Operations, said that UN peacekeepers “ civilian, police, men and women, military personnel“ save lives every day.